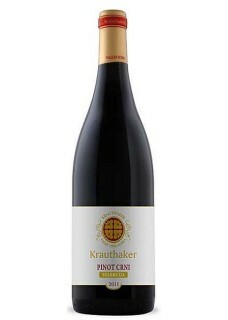 Kutjevo, Pinot Noir, matured for 13 months in previously used and new (15 percent) Bordeaux barrique oak barrels. Modern, plush, full and warm with considerable fruitiness in a harmonious blend with well composed herbal and spicy strands and a floral tone, vibrant on the palate with noticeable yet unimposing tannin structure, well rounded, of considerable length. Sparkling ruby colour with a discrete albeit entirely adequately strongly pronounced aroma needing some time to open up and exhibit a beautiful, complex bouquet with ripe, dark rubus fruits and drupes underpinned by caresses of smoke and vanilla, overtones of dark flowers and dried spice herbs and a trace of white pepper. Pure, pleasantly bitterish on the palate, with a good acidity, plush with fine grained tissue, harmonious, lasting, while the rubes are once again perceived retronasally.